Five years have passed since the passing of my beloved boy, the Mighty Quinn. Below you’ll find the simple but powerful memorial I shared to honor him then which still resonates as powerfully for me today. I wanted to add a few further recollections first as he is ever present in my life still. I have certainly shared a bit more of his story in our recently released book, and the final chapter, “Ashes Upon Kilimanjaro,” begins with one of my most intense reflections of Quinn’s role in my life. Quinn quite simply lifted me to heights I did not imagine before he entered my world. Well beyond the mountain peaks we climbed together, he brought me significant steps along the path of becoming more thoughtful and deliberate in my pursuit of meaningful goals in this world. Some might find it difficult to imagine how a canine can be so influential in anyone’s life but the story is clear and the rewards so very real. It is a small part of why I miss him so much even as I delight in the joy of his memory, the companionship of Autumn, Tracy and my many friends. I do celebrate my great fortune for the time we shared even as I still mourn his loss deeply. It is why anniversaries such as January 20 will always hold a bitter sweetness for me. I will welcome the bitter sharpening felt for the day of his departure because it is overwhelmed by the rewards of his dedicated, loving memory which is with me stronger on this day as well. Thank you, Quinn, for the many gifts you bestowed to me in all too short a time allowed us. 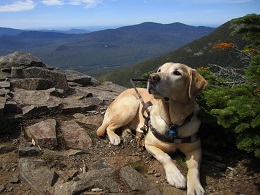 Read the memorial “In Honor of the Mighty Quinn” from January 20, 2014. « School visits start 2019 at heart of our mission! Quinn is a special part of our meeting the Pierce family and we can’t imagine their pack without him. We went to see them, to be inspired about how to keep going and not lose sight of your goals and dreams, even if health challenges and changes, as I was starting to face, including the fear of losing my vision, could derail you. Of anything, Quinn’s quiet gentle steady presence caught my eye and calmed me, and I couldn’t take my eyes off him for the whole talk. He somehow helped me feel it would be ok. And helped me to understand and value, even more, the presence of the two little guardian angel doggies in my life and that they’d lead me where I needed to go. A great gift of example. I hope our Delilah is with you Quinn. She LOVED adventures ! And I could never take her far enough, often enough, for long enough ! I hope you are taking her with you as your sidekick on your endless journeys of exploration, together. It was an honor to meet you all at least that once at UNH before we lost them both. They were both so full of life and up for adventure ! It still is hard to imagine them not being there as our doggie pack leaders. We literally bump into walls without her. It was because of Quinn that my life changed, and was literally saved by two fellow furballs. It was after that, that I recognized how these two little ones were acting as service dogs for me and saving me every day, and watching over me and alerting me even as I’d sleep ! We went and and got some more training and they were able to step fully into their roles and became prototype service dogs for my condition and sets of symptoms they alert for. Samson is trying to compensate for Delilah’s role and has begun to alert me for new symptoms where my breathing will be affected by humidity levels! He has saved my life numerous times through that already and alerts me for balance issues. Delilah would tell me when it was not ok for me to drive, and would tell me when it was time to pull over and get a hotel on long distance drives. She wouldn’t allow me to text, dial a number, or program the gps unless I was pulled over. I always had to have classical music or enya on in the car for her and she’d remind me of that too! She alerted me to life threatening blood pressure drops and blood sugar issues and cardiac and other symptoms as I slept especially if my breathing was impacted. She got me,and Samson, to do everything ! To go places and get out and make me want to take them on adventures and I got to go too ! To meet SO many people who were drawn to and comforted by their love ! I was just the chef chauffeur and nanny to two special souls ! They changed my life ! She got me to walk farther when I felt I couldnt take another step, cook for them delicious homemade meals through her enthusiasm that got me to eat fresher and non processed foods as I’m supposed to. She was my heartbeat and I breathe for Samson. They came into my life just as I was about to start losing my entire immediate family and everyone close to me to the same health challenge. It’s because we met you that day, Quinn, that I “got it” and understood and saw the role of my two little pack leaders in my life and they have kept me going for all these years. They used to watch my every move from the day they were born and now I know why ! And it was born out of love and our bond ! It feels they came here to help me xo. We are inseparable too. It was after we met you, that I realized they were trying to tell me they needed me in their line of sight at all times and we started going everywhere together day and night. I finally got it. Thanks Quinn. Delilah always liked blondes so hope you’re her new crush Quinn. Tell her, her brother Samson and I love her so madly, and are lost without her xo. We miss you, Mighty Quinn !